The film industry caters to cravings of its public, and American audiences have always craved one thing above all else: escapism. For a very long time, that escapism came by way of Westerns. Many of these films had very little use for realism or historical accuracy. They envisioned the American Frontier as a place where men settled their differences by way to the gun. The “white hats” operated according to a rigid code, which sometimes required them to kill. So long as blood was spilled in the name of revenge, or some other righteous notion, violent actions were never questioned. Such low regard for human life quickly became par for the course, and filmmakers dished it out heartily. Clint Eastwood has built a storied career off of such films. By the early 1990’s, his name had long become synonymous with both the Western and Action genres. Characters like Dirty Harry and The Man with No Name were the very definition of iconic. Nevertheless, Eastwood had grown weary of such fare. He was becoming more conscientious, and more sensitive to the effects his work had on the public consciousness. It was time for a change, and he had the perfect screenplay in mind. He’d been saving it for quite some time, and would now use it to send his grim persona out to pasture. Unforgiven begins in the small town of Big Whiskey, Wyoming. In a small room atop a local saloon, two drunken cowboys assault a beautiful young prostitute. The saloon owner demands restitution, as a disfigured prostitute is of little use to him business-wise. The other women under his employ demand a much harsher punishment, as the young girl could easily have been killed. The local sheriff, Little Bill Daggett (Gene Hackman), is brought in to mediate. He initially decides on flogging the men with a bullwhip, but instead opts for another form of compensation. Each man is required to turn over a number of ponies to the saloon owner for his trouble. Incensed, the women pool their meager resources and place a $1000 dollar bounty on the heads of the culprits. News of this bounty spreads far and wide. In Kansas, a young braggart named the Schofield Kid (Jaimz Woolvett) brings word of it to William Munny (Clint Eastwood). In his youth, Munny was a fearsome assassin. His violent exploits have since become the stuff of legend. Alas, he is now widower with a failing pig farm. He refuses the Schofield Kid’s offer, sending the young man on his way. 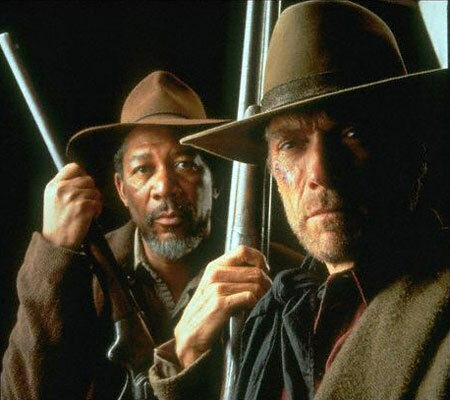 He later reconsiders, bringing in his old partner, Ned Logan (Morgan Freeman). The two men ride out to meet with the Schofield Kid. The trio then heads into Big Whiskey with guns in tow. Little Bill lies in wait for all who wander through his town hoping to collect on the fabled “whores gold.” Both Munny and Daggett end up on a collision course which will no doubt result in bloodshed. In the process, the sins of the past will be unearthed. Unforgiven was born during the mid to late 1970’s. Screenwriter David Webb peoples initially conceived the tale under the suitably grim titles The Cut Whore Killings and The William Munny Killings. For the first few years of its existence, the finished screenplay was attached to Francis Ford Coppola. During that time, it was brought to Clint Eastwood’s attention. The star became quite taken with it, and waited patiently in the wings until it became available. In 1983, at the age of 53 years old, he finally acquired it. Despite his initial enthusiasm, Eastwood sat on the project for nearly a decade. His hesitance was partially due to his vision for the main character, which he hoped to play. 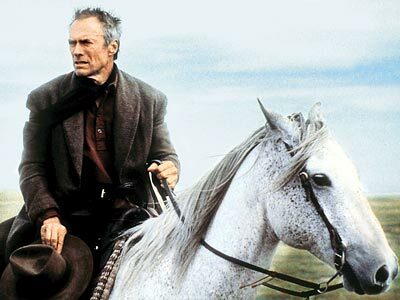 The Screenplay described William Munny as being in his late 30’s, but Eastwood imagined him as being much older. He also saw the film as being an epilogue of sorts. His days as a cinematic gunslinger would one day come to an end, and he meant to be prepared for the transition. By the early 1990’s, the time had finally come. Eastwood’s star power had begun to fade. A number of ill-conceived action vehicles had adversely affected his bankability. He’d become predictable. Audiences had moved on to younger, more exciting action stars to get their thrills. If Eastwood hoped to maintain any measure of credibility, he had to switch gears. Unforgiven went into Preproduction in the spring of 1991. Eastwood wanted the casting to reflect his considerable ambitions for the project. Gene Hackman was cast as the brutal Sheriff, Little Bill Daggett. Morgan Freeman would play William Munny’s running partner, Ned Logan. Richard Harris would be featured as English Bob. 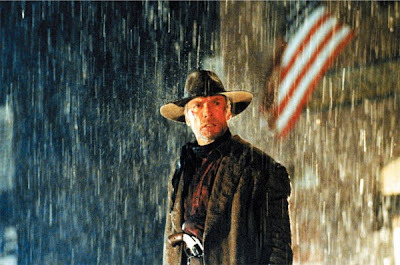 True to Eastwood’s vision, Unforgiven was quite unlike any of his other Westerns. It was not a traditional cowboy flick, nor was it highly stylized cartoon of the sort that Sergio Leone was known for. It eschewed the romanticism of old Hollywood for something more honest. It’s every bit a revisionist piece that seeks to deconstruct the genre. Genre aficionados will note that all the familiar tropes are present. There is the retired gun who straps on his six-shooters one last time. There’s also the “whore with a heart of gold.” Last but not certainly not least is the valiant lawman who seeks to defend the townsfolk from those who would prey on them. Eastwood honors these archetypes, while at the same time subverting them. They aren’t limited to the requirements of plot and convention. They react to their circumstances in a relatable and realistic manner. Both Little Bill and the saloon owner display the kind of callousness and casual chauvinism that one would expect from this kind of film. They see the women as property. In a huge departure from genre convention, Eastwood allows the female characters to have a voice. They are not merely passive victims, nor are they pawns of the male characters. They endure horrible indignities, yet are compelled to act on their own behalf. The films sense of morality is complex. It offers no easy answers. Bill’s punishment of the two cowboys is much too lenient. Yet the bounty posted by the prostitutes doesn’t exactly suit the crime. Despite her severe injuries, Delilah is very much alive after her ordeal. Yet, the other women demand considerably more than the requisite pound of flesh. The characters in Unforgiven see the world in terms of extremes. On the one hand is the veritable slap on the wrist. On the other is the guillotine. As played by Gene Hackman, Little Bill Daggett sees himself as merely keeping the peace. He’s an ex-gunfighter who’s worked the “tough towns” (Per the testimonials of his deputies). He knows what it takes to maintain order. In any other movie, the characterization would end there. However, Eastwood allows the viewer to look beneath the proverbial hood. In actuality, Bill is more of a feudal lord than a simple lawman. He rules through fear and intimidation. Though he claims to hate “assassins, and men of low character,” he employs many of the same tactics. Public beatings and torturous interrogations are part of his oeuvre. He is both a sadist and a coward. He enjoys doling out punishment, but never once engages in a fair fight. Whenever approaching a suspect, he is sure to have his armed deputies in tow. He enforces the city ordinance regarding firearms as though it were a commandment handed down from on high, yet he tolerates brutality against women (to a degree). By contrast, William Munny has no illusions about who he is, or more specifically, what he once was. His violent rampages as a young man were often fueled by alcohol. Both his alcoholism and his bloodlust were quelled by the love of a good woman. Without her to serve as his moral compass, Munny devolves. A less thoughtful film might put a heroic spin on his character arc. 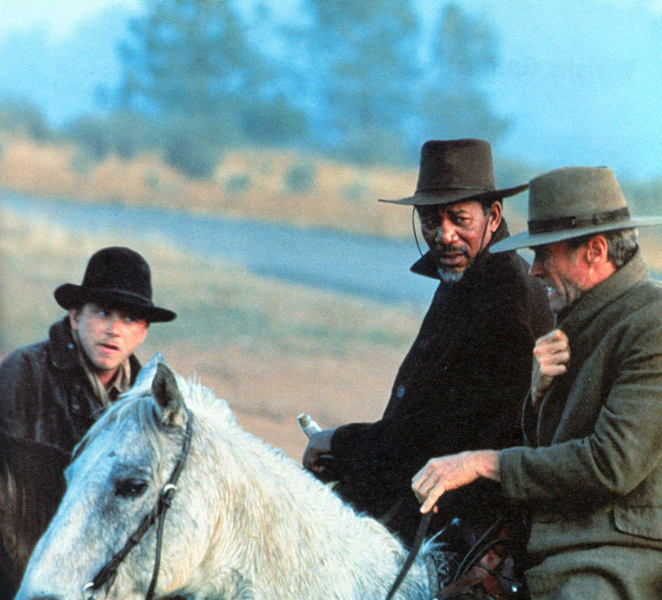 Unforgiven shows it to be exactly what it is: regression. His fall from grace is fueled by money, and later, vengeance. At journey’s end, he finds not redemption, but shame and regret. Ned Logan is the sacrificial lamb. Per the time honored cliché, he gives his life in protection of his white partner. This moment takes place off screen, and without any connotations of nobility or honor. Interestingly, Ned is essentially whipped to death. Whether or not this was a conscious choice on Eastwood’s part is unclear. With the pairing of English Bob (Richard Harris) and W. W. Beauchamp (Saul Rubinek), Eastwood comments on how the old west has been romanticized by Hollywood. English Bob is a gunfighter who seeks to capitalize on his violent reputation. He offers fanciful accounts of his violent deeds. Beauchamp, his biographer, takes him at his word. Once Bob is exposed as a fraud, Beauchamp makes Little Bill the focus of his next novel. In taking Bob’s place, Bill himself is also exposed as a deluded egotist. Beauchamp finds the “real west” in William Munny. Unlike Bob and Little Bill, Munny does not wish to have his brain picked, or his life immortalized. He is the low-hanging fruit on the tree of knowledge. Instead of enticing Beauchamp to take a bite, he warns him away. Last but not least is the audience surrogate, The Schofield Kid. Like the audience, the Schofield Kid seeks adventure and excitement. Also like the audience, his perception of the Old West is based on the fictions of dime novels. Reality proves too much for him to bear. Unforgiven often feels like a man doing penance for a lifetime of sin. 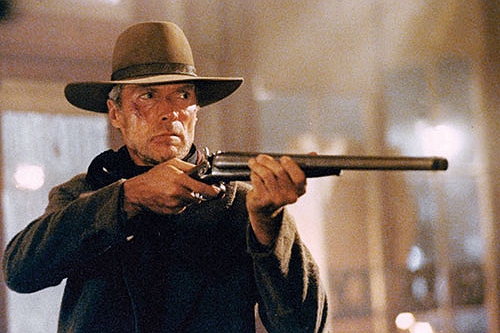 In Eastwood’s case, the sins in question amount to the repeated glorification of violent men. The motion picture academy accepted his apology graciously, bestowing upon it their highest honors. Instead of returning to his usual fare afterward, Eastwood pressed on in the new path he’d set for himself. That choice has yielded a number of films that are supposedly better and more meaningful than the ones he did earlier in his career. Alas, none of them have had the raw impact of Unforgiven. 20 years later, the stench of death still hangs around the film, and its guilt pangs can still be felt. Loved this Movie...Soundtrack is beautiful. Pale Rider was great also...especially when Clint goes up against the Rogue for hire Sheriff and his deputies. Interestingly an older t.v. western series stars the Sheriff circa (1959)...ah...Lonsome Dove...wish there were more of these type films being made !